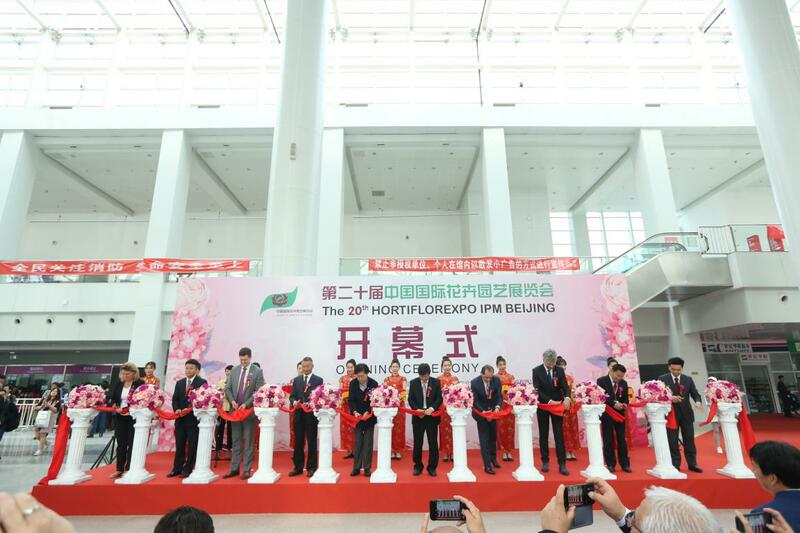 The 20th Hortiflorexpo IPM Beijing, organized by China Flower Association, managed by China Great Wall International Exhibition Co., Ltd. and Shanghai Intex Exhibition Co., Ltd. in turn, and Messe Essen GmbH from Germany being our Co-organizer since 2012, the large scale and the influential international brand trade show in floriculture, gardening and horticulture industry in Asia, concluded successfully in China International Exhibition Center, (New Venue), Beijing, held from May 10-12, 2018. The exhibition area of the 20th Hortiflorexpo IPM Beijing reached unprecedentedly 40,000 square meters, making a breakthrough for the first time in the development history of the show, attracting over 800 exhibitors and hundreds of brands from nearly 30 countries and regions, namely Australia, Austria, Belgium, Canada, China mainland, Colombia, Denmark, Ecuador, Estonia, France, Germany, HK SAR, India, Israel, Italy, Japan, Kenya, Korea, Lithuania, Malaysia, Saudi Arabia, Singapore, Spain, Sweden, Switzerland, Taiwan, Turkey, the Netherlands, UAE, USA, etc. Novel products, latest technologies, and new concepts in the fields of floriculture, horticultural materials, gardening machinery, garden greening, and horticultural facilities were displayed. We were also very honored to have Colombia pavilion, Dutch pavilion, Ecuador pavilion, German pavilion and Taiwan pavilion. Meanwhile, the expo attracted altogether 62155 person/time from 46 countries and regions, among which, 40937 having visited the expo, 35196 being professional visitors. High quality concurrent activities including Forums, Seminars, Technical Exchange Meetings, Thematic Displays and Flower Arrangement Show were arranged, with warm responses and active participation from the visitors. The expo was highly recognized by domestic and overseas exhibitors and professional visitors alike. The exhibition area of the 20th Hortiflorexpo IPM Beijing reached unprecedentedly 40,000 square meters,marching a big step compared with the previous editions. The number of exhibitors was 796, an increase of 17.2%, compared to 18th Hortiflorexpo IPM Beijing (679). The number of overseas exhibitors was 215, an increase of 13.8%, compared to 18th Hortiflorexpo IPM Beijing (189). From the distribution of exhibitors’ countries and products, we can see that exhibitors are from Asia, Europe, America, Africa, Oceania, bringing their novel products and latest technologies with strong local features, among them, some exhibitors making their products and technology debut in China. As the first Guest Country of the show, Dutch floricultural and horticultural industry has always played a significant role in the development of Sino-Dutch bilateral relationship, expressed by Mr. Stigter– Agricultural Consellor, Embassy of the Kingdom of the Netherlands to China. This year, Dutch government organized 27 Dutch flower enterprises to join the show as national pavilion, the number of exhibitors being the biggest in national pavilion and the exhibition area reaching 630sqm. Dutch floricultural and horticultural industry regards innovation and sustainable development as important principles and attaches great importance to exchanges and cooperation among enterprises. Sino-Dutch Horticultural Development Forum has been held every year and Sino-Dutch flower trade and cooperation will have broad prospect. As the int’l cooperation partner of the show, Ms. Sabine Großkreuz, Senior Vice President of Messe GmbH, Germany, said the effect was remarkable through win-win cooperation of IPM Essen with Hortiflorexpo China. This year, the exhibition area of German Pavilion was 240sqm, with 14 famous exhibitors who are supported by Federal Ministry of Food and Agriculture, Germany BMEL actively participating. Meanwhile, with the assistance and help from the Organizing Committee, Messe Essen GmbH also organized IPM int’l pavilion, with exhibition area being 1161sqm, including Ecuador Pavilion and Colombia Pavilion, etc. The active participation of exhibitors, on the one hand, reflected the influence and strength of Hortiflorexpo IPM, with her internationalization and professionalization being highly recognized in the floricultural and horticultural industry, marching forward toward an int’l professional exhibition; on the other hand, with economic development and policy encouragement, floricultural and horticultural industry is still on the rising development phase, with flower market being full of opportunities and vitality! 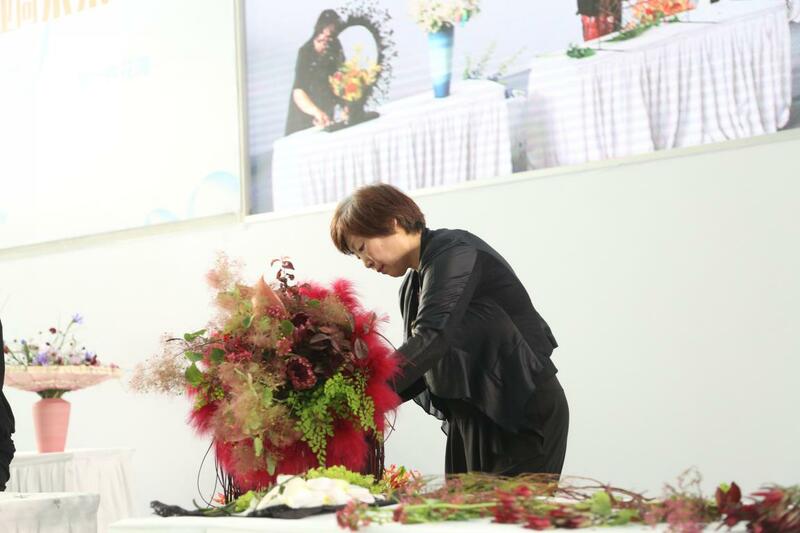 There were 15 activities including Flower Arrangement Show, Forum, Seminar, New Product Release,Taobao Flower Gardening Seller Meeting, etc, and 11 static display sections including Supply and Demand Purchase Exchange Meeting, Retail Industry Thematic Display Area, Garden Center Thematic Display Area, Vertical Greening Thematic Display Area, Taobao Flower Gardening Seller Area,Combined Potted Works Display Area, Succulent Plant Display Area, “Annual Flower King”Awarded Products Display Area, on-site Flower Arrangement Works Display Area,Static Flower Arrangement Works Display Area,Pioneering Florists’ Works Display Area. It lasted 2.5 days and provided audiences with wonderful visual enjoyment and professional comments. Several well-known florists both at home and abroad not only performed the art of flower arrangement on-site, but also interacted and exchanged ideas with the audiences, teaching them their experiences and skills, offering rare study opportunities for flower store operators and masters to exchange and communicate face to face. During the flower arrangement performance period, the audiences responded warmly. Due to the limited seats available, many practitioners and visitors just stood there earnestly for 2 days, learning very eagerly. Seeing the scene, the organizing committee of the expo opened on-site Flower Arrangement Works Display Area on purpose, so that the visitors could appreciate the masters’ works with no distance. ②Cutting-edge industry seminars, which you cannot afford to miss! It was managed by Potted Section of China Flower Association. The aims of the Summit are to base on serving industry, build trading platform, promote industry exchange, product display, promote industry development, upgrade industry level, adapt to market demand. We will accelerate the transformation and upgrading of potted garden industry chain enterprises and develop modern potted garden industry. From the point of view of new varieties protection, with professional perspective and ways of thinking to discuss various kinds of questions, including Professional PBR Lawyer And G-Man Teach You How To Collect Key Evidences Of Infringement And How To Against PBR Infringement In China, To Bring Your New Varieties Into Chinese Markets & The New Ones Created In China Abroad, etc. Sponsored by China Flower Association (CFA), Organized by China Flower Association (CFA) Potted Plant Branch,Anthurium Industry Group from the CFA Potted Plant Branch,Dashun International Flower Co., Ltd., Guangzhou Flower Research Center, “2018 National Anthurium Industry Forum”was held in order to improve the production technology level of Anthurium industry, raise product quality, grasp the Anthurium trend and market change.In-depth discussions were arranged. The Forum provided a platform for the seedling producers, manufacturers and distributors. High-efficiency garden plant protection is an inevitable historical development,High-efficiency garden plant protection and hosting services will become popular soon, The marketization of high-efficiency plant protection, High-efficiency plant protection medicine artifact technology to explain, etc. The past and present situation of product types and sales mode in Europe, Product Type in China and market situation, Video and photo share of growing procedure and finished plants from growing kits were discussed and conducted. The Co.’s products and development history were elaborated, including The advanced CRF technology for Osmocote, The history of Osmocote, Introduction for ICL Specialty Fertilizer development, Introduction for WSF Peters, etc. There were Technical seminar for cultivation of Hibiscus and Technical seminar for cultivation of Dianthus,explaining the new varieties of Hibiscus and Dianthus more suitable for potted flowers,and recommending the cultivation technologies for new Hibiscus and Dianthus varieties. Same as the previous editions,“Sino-Dutch Forum”was held concurrently with the expo, serving as a significant platform for Sino-Dutch enterprises to communicate with each other, exchange ideas, negotiate and cooperate in business.With meticulous organization of Agricultural Section of the Embassy of the Kingdom of the Netherlands,8 enterprises with Dutch financing background had discussions on Sustainable Potted Flower Production and Flower Park Development, Horticultural project in China,E-times for sharing, etc. There were frequent on-site interactions and heated discussions. It was held by the《Agriculture Engineering Technology(Greenhouse Horticulture)》journal, China Agriculture Mechanization Association Protected Agriculture Sub-Association, China Great Wall International Exhibition Co.,Ltd.,which means to show the current facilities agriculture leading edge technology development at home and abroad,sharing the new technologies, new products, new solutions of the Greenhouse gardening industry. Representatives from altogether 7 excellent enterprises spoke at the forum. China National Construction Research Association of Green Construction and Energy Conservation Professional Committee and International Green Roof Association organized “Vertical Greening New Products, Latest Technologies Forum”. Five honourable guests discussed the topics of The Development Prospect of Vertical Greening in Green Building, The fifth facade of the building is green, beautified, and ecological, Vertical Greening Ecological Restoration of Urban Areas, Local Flowers and Flowers Enter the New Age, The Technology of Making a Rainforest Ecological Cylinder. The speakers and audiences talked about their minds openly and heatedly. With new concept, new model and new thinking as the main direction of the forum, taking the retail demand of flower industry as the point of appeal, we invite distinctive speakers in the industry to share their ideas. At the same time, with the forum as an opportunity, we promote the 5th China Cup Flower Design Competition (2018) and the World Flower Design Competition in Beijing, 2019. Senior experts provided“Mainly focus on the application of nursery plants and trends in China with practical cases analysis”and “Talking about China nursery business situation and development by authoritative data”, with professional, rich and colorful contents. It was a brand-new experience. At the meeting, the relevant responsible person introduced the new ideas and directions of Taobaoflowergardeningin2018, and answered questions in operation. The sellers and buyers had a face to face exchange opportunity, thanks to this meeting platform. Although China's private garden construction industry has a long history, it can also be said to be an emerging industry. With the continuous upgrading of the concept of garden consumption, more and more gardening companies have mushroomed and how the private garden industry should move forward. It also requires everyone's joint efforts. This “private garden design and construction”seminar, organized by GARDEN GATHERING, focused on the courtyard industry market development status and future trends, explore the new situation, how to better develop the market and lead the market. Taobao Flower Gardening Seller moved on-line popular stores to the venue. Taobao Sellers were very happy with the visitors’joining and attention, which was a quite successful experience. “Annual Flower King”WeChat Popular Exhibits Appraisal activity continued the publicity mode of Hortiflorexpo IPM Beijing 2016, but with wider influence and higher participation. Through mobile phones, Champion, second place,third place obtained over 100,000 votes in the final competition. Exhibits categories were classified and Champion,second place,third place were appraised according to different categories. Almost all exhibitors took part in the activity and spread the news of appraisal actively. The meaning of “Annual Flower King”WeChat Popular Exhibits Appraisal was significant. It not only provided a good chance for the professionals to know the high-quality products of the exhibitors, but also an excellent mode of publicity for the show. 1. 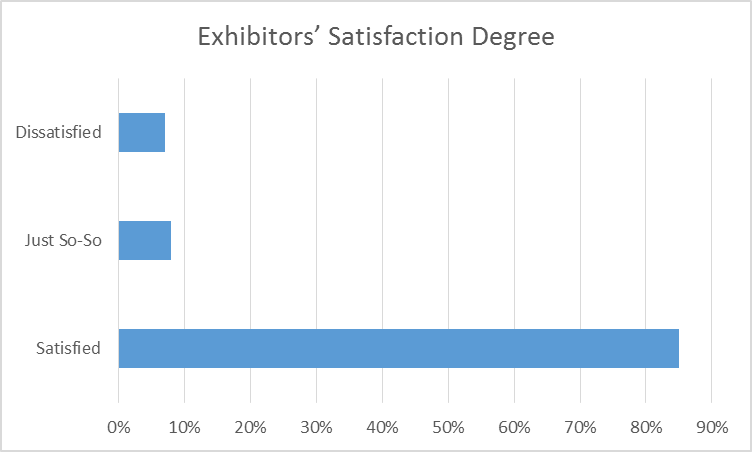 About 86% of the exhibitors are satisfied with the effect of participating the show, 13% say just so-so, near 1% are dissatisfied. 2. About 84% of the exhibitors are satisfied with the quality of the visitors, 15% say just so-so, 1% are dissatisfied. 3. 92% of the exhibitors are satisfied with the quantity of the visitors, 7% say just so-so, 1% are dissatisfied. 4. 89% of the exhibitors are satisfied with on-site activities, 11% say just so-so, 0% are dissatisfied. 5. 92% of the exhibitors are satisfied with the publicity of the show,8% say just so-so, 0% are dissatisfied. 6. 50% of the exhibitors are satisfied with the hall service, 8% say just so-so, 42% are dissatisfied. 1. 95% of the visitors are satisfied with the purpose of attending the show, 4% say just so-so, 1% are dissatisfied. 2. 89% of the visitors are satisfied with the organization of the show, 10% say just so-so, 1% are dissatisfied. 3. 95% of the visitors are satisfied with the quality of the exhibitors, 4% say just so-so, 1% are dissatisfied. 4. 95% of the visitors are satisfied with the scale of the show,5% say just so-so, 0% are dissatisfied. 5. 73% of the visitors are satisfied with the on-site service of the show, 20% say just so-so, 7% are dissatisfied. 6. 94% of the visitors are satisfied with the preview publicity of the show,5% say just so-so, 1% are dissatisfied. The summary of the show is as above. If you have any comments or suggestions, please contact with us at any time, so that we can prepare well for the next edition of the expo, which will take place in Beijing in May 2020. Wish you have a successful business and a happy life!